CRISTIANO Ronaldo has taken one more step to move on from his former club Real Madrid as he looks to leave behind his recent run-in with Spanish tax authorities. The five-time Ballon d’Or winner has reportedly sold his home in Madrid, a €5.3 million luxury mansion in the La Finca area of Pozuelo de Alarcon. The seven-bedroom, eight-bathroom home boasts indoor and outdoor swimming pools, a football field and a gym. The property was the new Juventus star’s pride and joy for ten years, featuring monogrammed door handles and a Buddha statue out front. The football star will be moving to Turin, Italy with girlfriend Georgina Rodriguez and their four children. 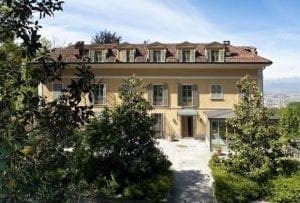 He has bought two connected villas on a hill, with an impressive view of the city and lush vegetation providing shelter from the prying eyes of neighbors, paparazzi, or curious fans. These villas are just as extravagant as his Madrid home, with separate entrances to each villa, expansive gardens, an indoor swimming pool, and, of course, a well-equipped gym. The neighborhood is a popular spot for the rich and famous. Ronaldo’s modern mansion is near the residence of John Elkann, Italian-American businessman and president of Fiat Chrysler Automobiles.